Unisex FootCarely 8-in-1 Bunion Relief Bundle! 1) SIMPLE TOE SEPERATOR: It is used for: 1. For Pre and post-operative bunions 2. Reducing friction between toes 3. Relief the pain of your feet & toe. 2) TWO LOOPS TOE SEPERATOR: It keeps the big toe in proper alignment, reduce rubbing against tender bunions, prevent toe overlap and cramps & cushioning the toes to reduce the risk of calluses & corns. 3) ONE LOOP TOE SEPERATOR WITH BUNION GUARD: With an insulating pad that fits between the big and second toes, this gel protectors instantly stop toe overlap to reduce skin irritation & cut down on the risk of infections, calluses & corns. 4) WIDE FOOT CUSHION: It is great for Runners, Walkers, Speedwalkers & Hikers. Helps provide symptomatic relief for vMorton's Neuroma, Sesamoiditis, Blisters, Corns - Calluses, Healing Fracture, Post Surgery, Broken Metatarals & Metatarsalgia. 5) QUINTUPLE LOOPS TOE SEPERATORS: It instantly begin to provide relief by improving the alignment of each & every toe. It separates & lengthen the toes, greatly reducing strain on the joints. 6) TOE SPACER GEL: It hugs your toes & keeps them in an aligned position. It increases spaces between toes for Proper toes alignment & can help for pedicure too. 7) Double Loop Bunion Shield With Toe Separator: It is used for immediate and long-term pain relief in case of calluses, corns and bunion problems. It has the ability to absorb pressure and ease pain on the sore bunion joint. Comfortable and powerful grip keep your toes straight and aligned & helps you move quickly as you jog, hike and play. 8) Big Toe Strap Bunion Straightener: This Big Toe Strap will restore the natural alignment of the foot and keep your big toe in the correct position. Comfortable to wear and one size fits all feet. We Stand By Our Products With 100% Money-Back Guarantee. GET BACK TO HEALTHY LIFE WITHOUT WORRYING ABOUT FOOT PAIN AGAIN - Immediate Pain Relief Results and Prevent Surgical Treatment. Nothing can replace corrective bunion surgery, but our cushions, pads, spacers, and shields often provide enough relief that you can get back to your normal routine if you are hamletive about your options. Stop struggling with foot pain and find immediate relief with FootCarely's Original Bunion Pad & Spacer Package. 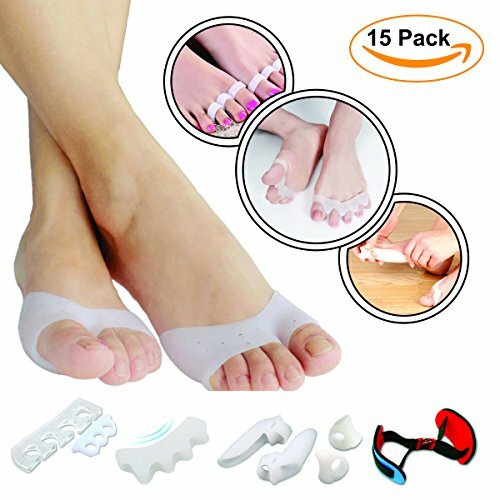 15 PIECE PACKAGE FOR INSTANT NON SURGERY BUNION PAIN RELIEF - This Bundle Package has been designed with you in mind a comprehensive package to treat aid and provide instant relief. Comfort toe pain, faster healing time and pain free mobility. Designed for the symptoms of Bunion and Hammer Toe pain while standing or being active. These greatly help Straighten crooked or overlapping toe to reduce pain in Knees, Hips and Back. For Pennies a day give your feet what they need to heal. If you have any questions about this product by Foot Carely, contact us by completing and submitting the form below. If you are looking for a specif part number, please include it with your message.